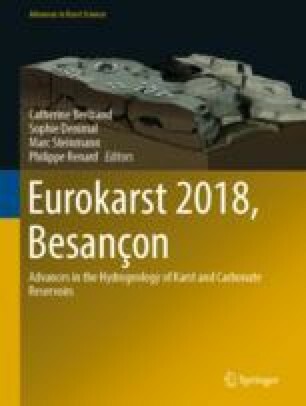 This study aims at characterizing spatiotemporal variability of the fate of nutrients in the karst basin of the Loue River in the French Jura Mountains. The long-term temporal analysis (40 years) shows that the NO3 increase from 1970s to the 1990s followed by a no-trend period in 2000s. The changes are linked to the usage of mineral fertilizers. The short-term analysis shows that the degree of aquifer saturation at the beginning of the hydrological cycle is a key factor to assess NO3 mobilization during the recharge events. Contrary to nitrate, the PO4 concentrations are disconnected from agricultural practices and are probably the consequence of point-source contaminations from domestic wastewater. Annual loads were estimated on 5 sub-basins in order to characterize the spatial variability of water contamination. Difference in fluxes for each sub-basin highlighted the most impacted reaches, providing information on hydrological units where anthropogenic pressure is highest. A correlation of NO3–N loads with the surface area of main crops using highest level of fertilization and tillage (field crops, temporary grasslands) is proposed, highlighting the environmental impact of most intensive agricultural practices (inventoried in a small area covering less than 10% of the whole basin). This study illustrates complex interactions between agricultural practice and hydrological function and gives first insight into the fate of nutrients in karst environment. This work was funded by the Rhone-Mediterranean and Corsica Water Agency, the Doubs Department, and the French Geological Survey (BRGM). Charlier J.-B., Desprats J.-F., Ladouche B., 2014. Appui au SCHAPI 2014 – Module 1 – Rôle et contribution des eaux souterraines d’origine karstique dans les crues de la Loue à Chenecey-Buillon, Rapport BRGM/RP-63844-FR, 109p, http://infoterre.brgm.fr/rapports/RP-63844-FR.pdf. Charlier J.-B., Vallet A., Hévin G., Moiroux F. 2018. Projet QUARSTIC: QUAlité des eaux et Réseau de Surveillance des rIvières Comtoises. Rapport final. BRGM/RP-68315-FR, 150p, http://infoterre.brgm.fr/rapports/ RP-68315-FR.pdf. Dörfliger N., Pinault J.-L., Petit V., Jauffret D., 2004. Systèmes karstiques et crues du Doubs. Méthodologie de détermination de la contribution des systèmes karstiques aux écoulements de surface, lors de crues et des étiages. BRGM/RP-53063-FR, 182p. http://infoterre.brgm.fr/rapports/ RP-53063-FR.pdf.